A public space for friends and family to keep up with me. Ever since I started cross stitching I've become a bit of a frame junkie. It doesn't matter what kind of a store I'm in, chances are they'll have frames, and I'll be drawn to them. I love all sorts of frames. Corny frames, plastic frames, metal frames, really giant elaborate frames, teeny tiny frames, and of course, wacky themed frames. Sure, most embroidery is wonderful when left in the hoop, but I think a special frame for a cross stitch or embroidery really makes the design something amazing. This weekend I finished two projects that took regular frames and made them into something new. The first was actually inspired directly from the quote that is stitched onto it. The quote is from Dr. Horrible's Sing Along Blog. 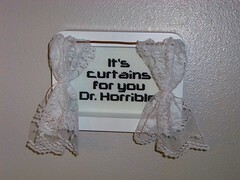 Captain Hammer says to Dr. Horrible (while choking him), "It's curtains for you, Dr. Horrible. Lacy, gently wafting curtains." I don't know exactly how I came up with the idea other than the usual, "Wouldn't it be funny if..." and the stitch was done. But of course, it wasn't that easy. The finished stitch was bigger than the frame I had purchased for it. I went to the store again and had to buy a new frame as well as new curtains (and I'm glad I did, my original ones were not as awesome). The second idea I got just came to me randomly. I was wandering the aisles of Hobby Lobby and was in the wooden items section. I saw a frame and thought to myself, "Wow, that looks like an etch a sketch, wouldn't it be funny if..." Sadly, I didn't buy the frame at the time because it was broken. Every time I went to Hobby Lobby for the next month, the kind of frame I wanted was warped, broken, or didn't look that great. Finally I went last week and found one that was in good condition. I started painting, putting together the discs for the white knobs, and stitched some doodles on gray fabric. 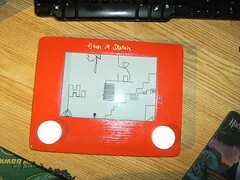 So my etch-a-sketch embroidery was born! I'm pretty proud of both of my projects, and would love to do more cool looking frames. 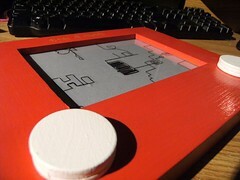 Right now, I'm considering making a few of the Etch-A-Sketch frames to be sold on etsy, so others can make their own doodles. Your crafts are made of win!! I really like this quirky inspiration for embroidery & framing. Thank you for sharing it. Thanks for featuring me Jennifer! Craft Monday: A new kind of craft!